When one face such situation what he really needs is not just simple lectures from internet about motivation but a live example whom he can follow and idolize. So for such scenario it is necessary to have a gym buddy or gym partner who is always motivated and pumped up to go for the extra mile and in this process he won’t leave you behind and will accompany you to make your work out session competitive and interesting. 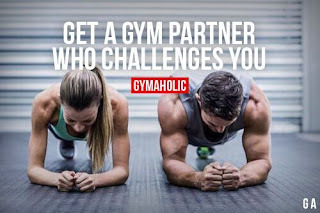 There are various option or characteristics you must look in a person before choosing him as your gym partner some of them are described below, if you found someone with these attributes you must make him your gym partner for long period of time. According to the expert trainers, exercise is considered as the easiest thing to be skip if you are having a busy schedule. In other words, people tend to skip the training session on busy schedule which is not good at all you have to be very much sorted in your mind about your priorities and hitting the gym is also your priority so you should not skip it at any cost but consider you have made up your mind to skip it but if you have gym partner who is reliable and considered to be the most consistent guy in terms of training then he won’t let you skip the training session easily. So always try to make a guy your training partner who is punctual and consistent otherwise if he is not consistent than not only he will skip the training but you will also be skipping the sessions with him. So reliably does matter. Look for guy who understand your style of training and won’t be forcing you to do the things which you could never do. Like if you are the one who like to take 2 seconds break between sets than he must not force you to skip this break and understand your order of work and you understand his. If you are looking to achieve quick and better results with your gym sessions than your gym partner must has to be stronger than you because if you are performing two repetitions than he must have performing three because you look him for motivation, if he himself is weaker than you then you will only be demotivated from his sets rather motivation yourself from him. Try to find out the stronger gym partner who can push you to do more. Always look for a gym partner who does not only preaches to go for an extra mile and say to have an extended session but also himself do it first. If he will practice what he preaches to you than it will boost your energy level and there will be competitive repetitions between both of you, resulting quick and better results. If he does not shout unnecessarily while pushing for extended sessions or while motivating you than it’s a positive sign because if he does shout while motivation than you have opted the wrong gym partner for yourself. A gym partner must support you whenever you feel less motivated or less energetic. He should be there to support you when you ask him to have extended sessions. Support is integral in gym sessions. You must look for a guy who possess similar goals like you. in other words if you have the priority to first to chest exercise than legs exercise than your partner should also be looking to follow the same manner of exercise to keep the competitive atmosphere between you and him as it will motivate both of you to outperform each other. While doing exercise you does not seek lectures on motivations or fitness rather you want some lite guidance or correction that whether your back is bending at the right angle or not, whether you should do more sets of legs exercise or not, in simple words he should understand his and your’ action as he should be quite aware of the safety rules too.